The founders of Fresh beauty are great home cooks, but their healthy recipes were starting to bore them. Superchef Barbara Lynch teaches them a few simple tricks. Having a chef as a friend comes with perks. For example, Boston chef Barbara Lynch of No. 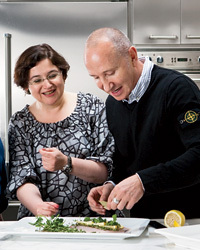 9 Park, the Butcher Shop and Sportello recently gave pointers to two friends—Lev Glazman and Alina Roytberg—who were hoping to make their healthy weeknight recipes more delicious. Both are excellent home cooks who, as the founders of Fresh beauty, use superfoods like mangosteen and açai in their company’s lotions and creams. Lynch, an F&W Best New Chef 1996, transformed their favorite dishes with a few simple tricks from her cookbook Stir: Mixing It Up in the Italian Tradition. “I’m always dieting, and my secrets are cardamom, cumin, cayenne and coriander,” Lynch says.